Plastic Omnium supplies the new Range Rover Evoque with a hybrid plastic tailgate that consists of a sheet molding compound (SMC) inner structure and a thermoplastic lower outer panel. The structure provides a 30 percent weight reduction compared with the same part made of steel. The use of SMC provides rigidity properties required to meet the mechanical specification of a tailgate. ContiTech's subsidiary Benecke-Kaliko supplies PVC laminates for the compact SUV's door panels. The new product helps save several kilograms of weight on door trim alone, since the polyolefin foam applied to the film is about six times lighter than PVC foam. Benecke-Kaliko also supplies several products to the instrument panel. Other parts in the Evoque from ContiTech include diaphragms for fuel management, multirib belts, timing belts and charged air ducts. Huf Huelsbeck & Fuerst & Co. KG delivers the model's locksets with keys, brackets and door handles. The door handles come in two versions: standard and with passive entry functions. The business for the Range Rover Evoque will be handled by the company's UK plant due to the close proximity of the Huf site to the Jaguar Land Rover site. 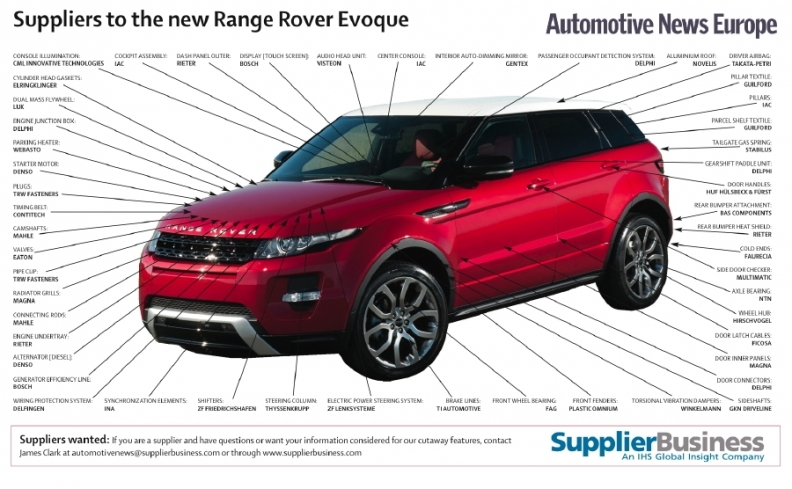 The Evoque is built on the CD-EU platform at Jaguar Land Rover's plant in Halewood, England. IHS Automotive forecasts that Evoque output will peak at 70,000 units 2013.